According to him, when she came to interview him in February 2003, he tried to kiss her thinking she was consenting. He said Tristane Banon rejected his advances, so he didn't insist and she left quite normally. She, on the other hand, says he forced her to the floor and she had to kick and punch to get away. 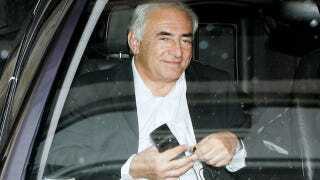 DSK hasn't yet been charged in France, but even his own account makes him sound pretty sleazy.